Properties in Rivières average 4.7 out of 5 stars. House of 240 M2 with swimming pool of 15M / 7 and ground of 1800 M2 closed. Property 39: House of 240 M2 with swimming pool of 15M / 7 and ground of 1800 M2 closed. Property 49: Chalet in the Cevennes, quiet, independent, with pool, close to shopping areas. 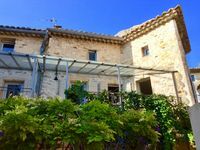 My wife and I enjoyed a wonderful week in this lovingly restored, comfortable and well equipped house, situated in a quiet historic hill-top village. Would highly recommend.